August entries in the 1876 diary of Ida Isadore Reynolds (1860-1946) of Acton, Maine. Ida would marry John Jotham Shapleigh (1856-1923) in 1881. 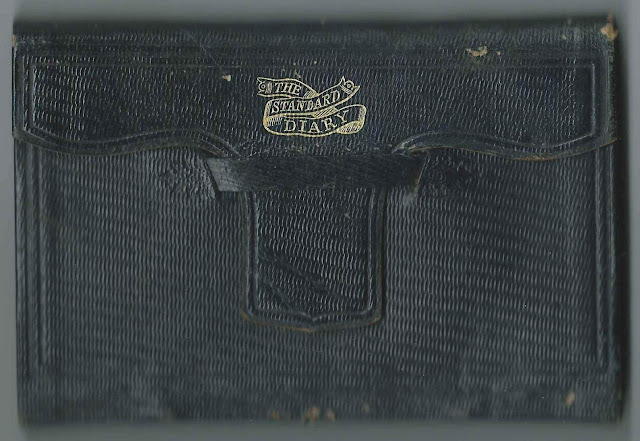 Links to the months of September 1876 and July 1876 appear here and at the end of this post. 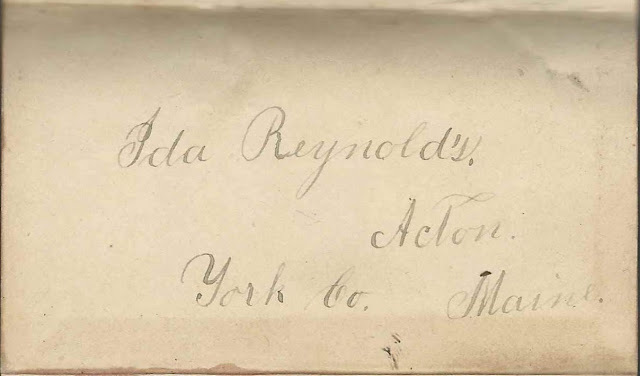 Since early July, Ida has been working for the Wesley family at their inn on Martha's Vineyard, Massachusetts, at No. 25, Commonwealth Sq. In 1879, the Wesley family would open the Wesley House. Ida will leave Martha's Vineyard for home on August 29, 1876, take the boat to New Bedford, Massachusetts and travel to Boston, Massachusetts, where she'll spend the night with "Mrs. Hersom", possibly Emily Jane (Prescott) Hersom (1843-1901), wife of Joel G. Hersom (1840-1900), presumably at Boston, Massachusetts. 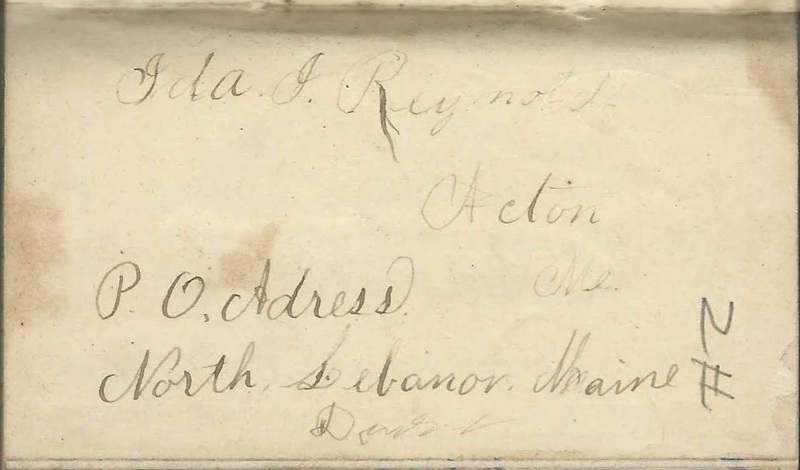 Ida will then travel with to Milton Mills, New Hampshire, where she'll spend three nights with her maternal aunt Lucy Jane (Tupper) Sawyer (1837-1880) and husband Rev. Seth Sawyer (1808-1892), before reaching her own home in Acton, Maine, on September 2, 1876. Wednesday, August 2, 1876: Fair. Nothing new today, I guess. Every day is nearly the Same. 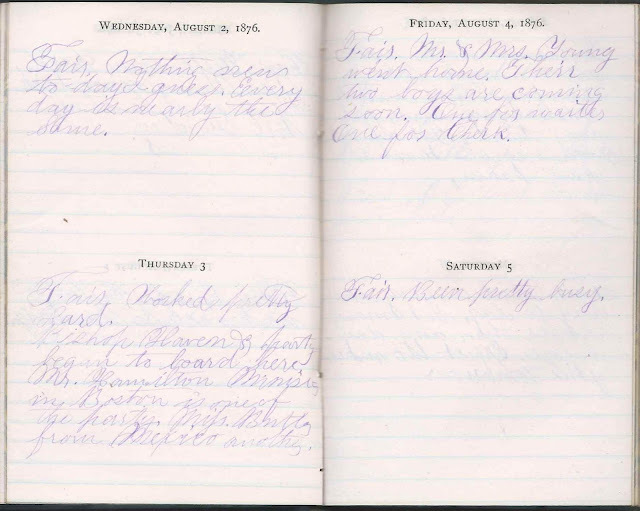 Thursday, August 3, 1876: Fair. Worked pretty hard. Bishop Haven & party began to board here. Mr. Hamilton, Minister in Boston, is one of the party. Miss B___ [Butler ?] from Mexico another. 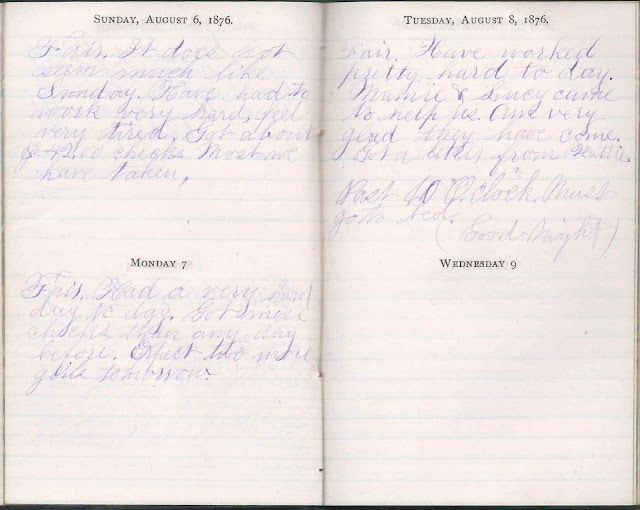 Friday, August 4, 1876: Mr. and Mrs. Young went home. Their two boys are coming soon. One for waiter, one for Clerk. 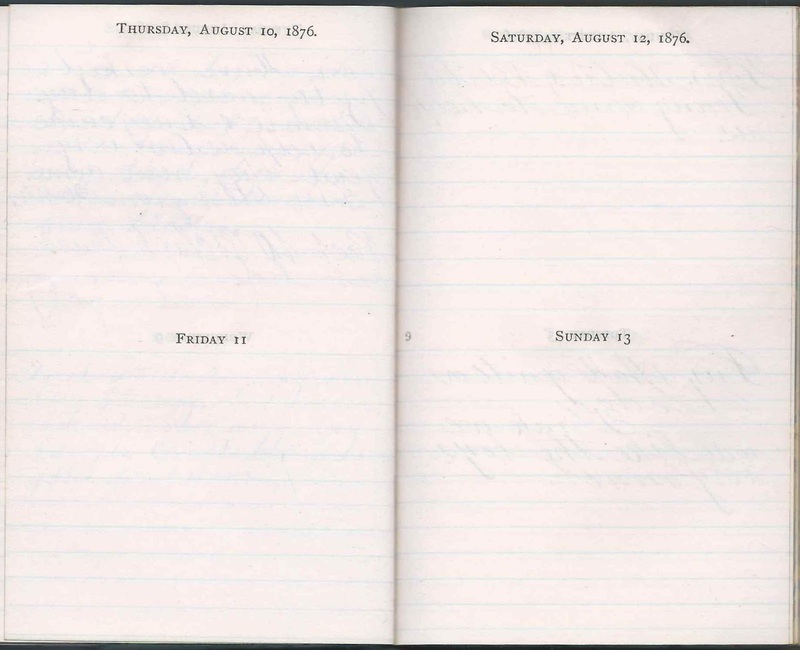 Saturday, August 5, 1876: Fair. Been pretty busy. Sunday, August 6, 1876: Fair. It does not seem much like Sunday. Have had to work very hard, feel very tired. Got about $42.00 checks. Most we have taken. 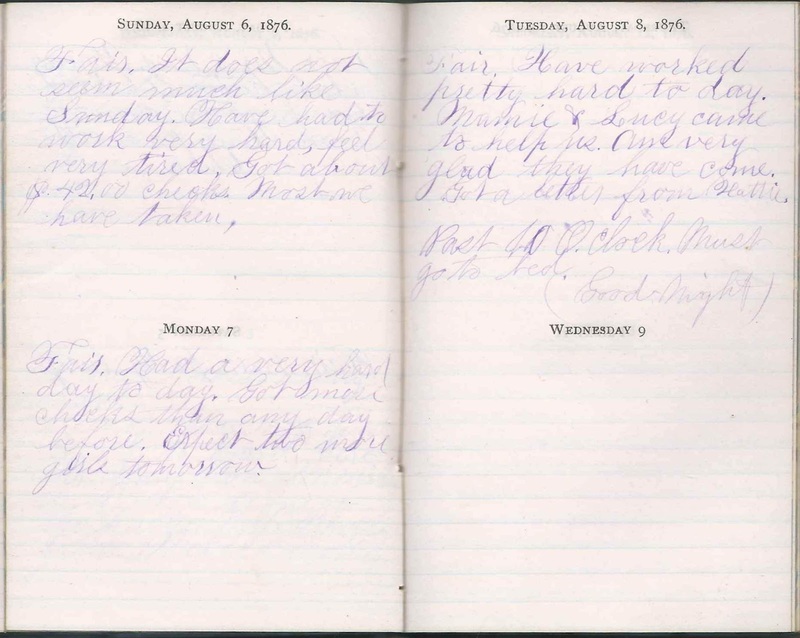 Monday, August 7, 1876: Fair. Had a very hard day today. Got more checks than any day before. Expect two more girls tomorrow. 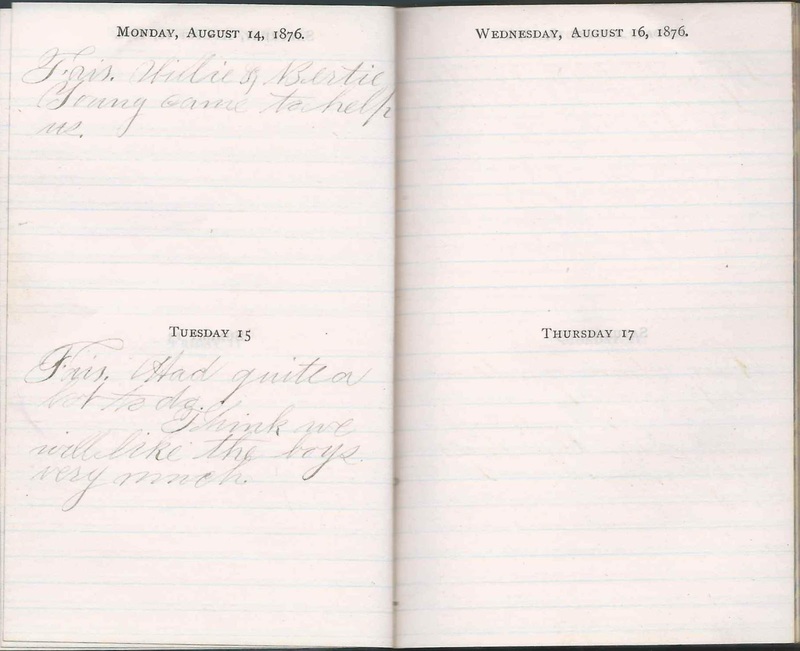 Monday, August 14, 1876: Fair. Willie & Bertie Young came to help us. 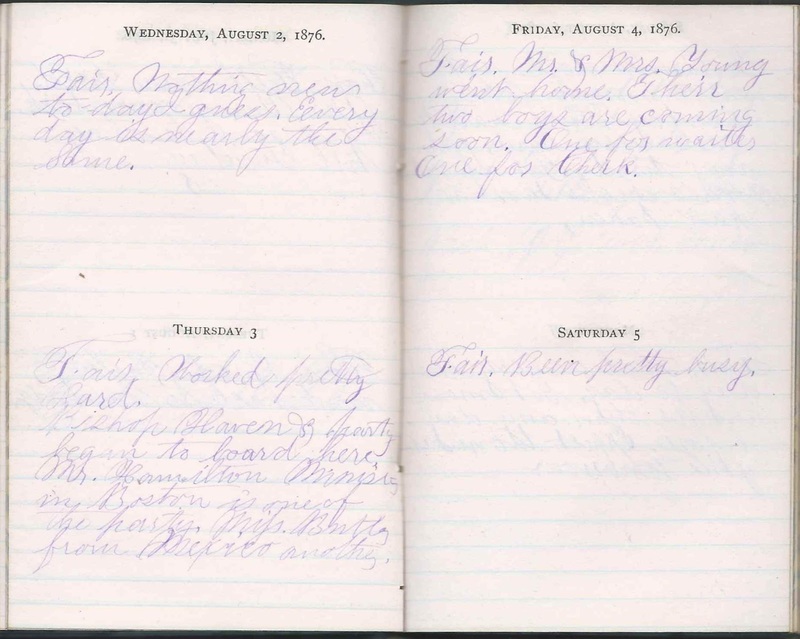 Tuesday, August 15, 1876: Fair. Had quite a lot today. Think we will like the boys very much. 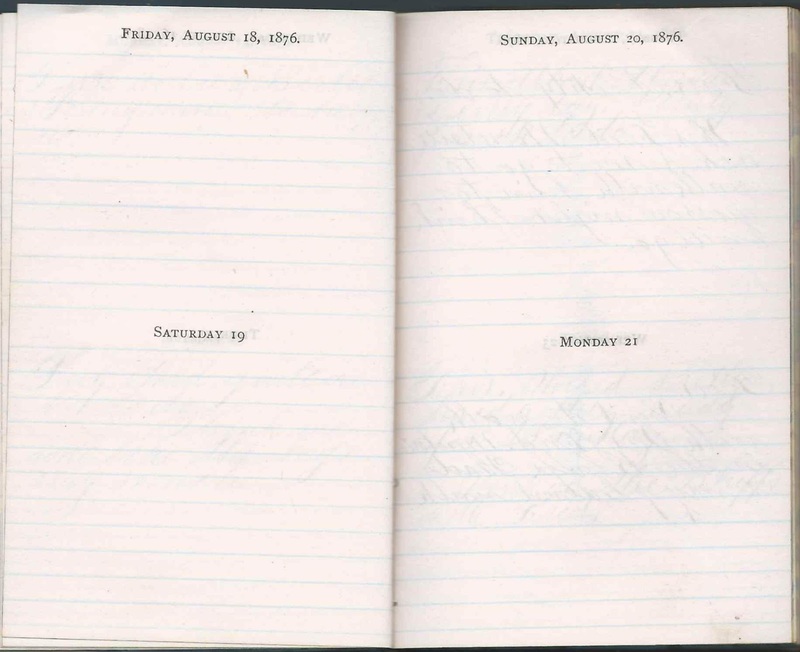 Wednesday, August 16, 1876: No entry. Tuesday, August 22, 1876: Fair. Plenty to do. Mr. Fred Montsie asked me to go to walk with him tomorrow night. Think I will go. Wednesday, August 23, 1876: Fair. Wet to walk with Mr. Fred Montsie on the Bluffs. Had a very pleasant walk. Thursday, August 24, 1876: Fair. About the same as every day. Plenty of work to do. Friday, August 25, 1876: Fair. Worked Pretty hard getting ready for Sunday. Went on the Bluffs with Fred. 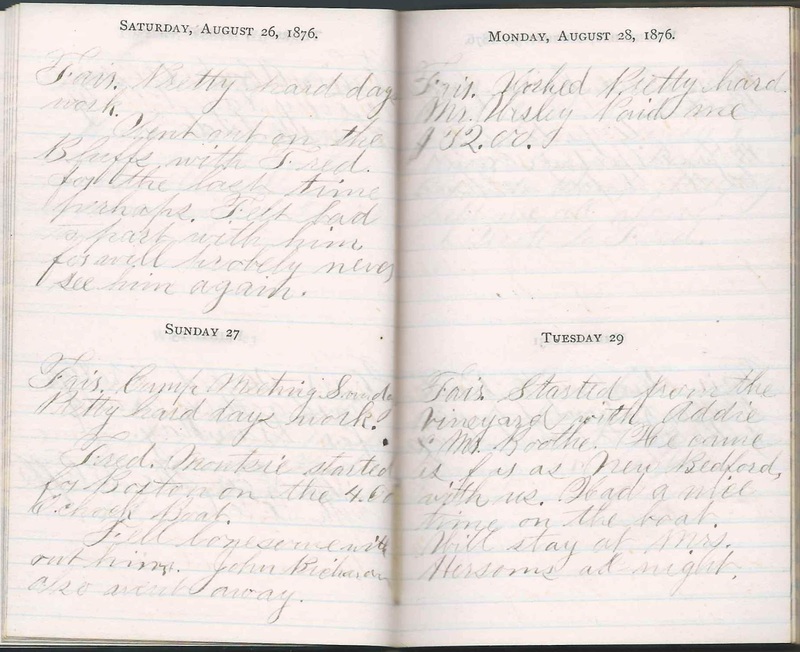 Saturday, August 26, 1876: Fair. Pretty hard day's work. Went on the Bluffs with Fred for the last time perhaps. Felt hard to part with him for will probably never see him again. 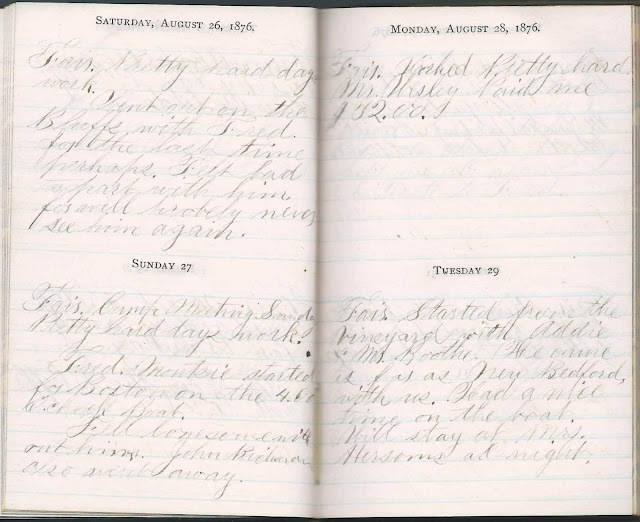 Sunday, August 27, 1876: Fair. Camp Meeting Sunday. Pretty hard day's work. Fred Montsie started for Boston on the 4:00 o'clock boat. Felt lonesome without him. John Richardson also went away. 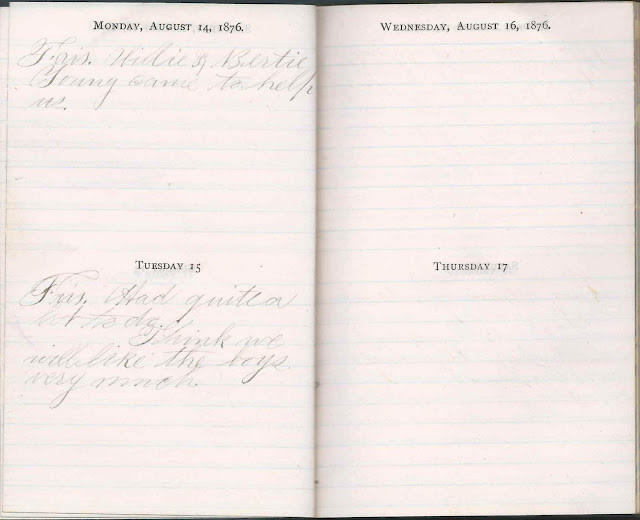 Monday, August 28, 1876: Fair. Worked pretty hard. Mr. Wesley Paid me $32.00. 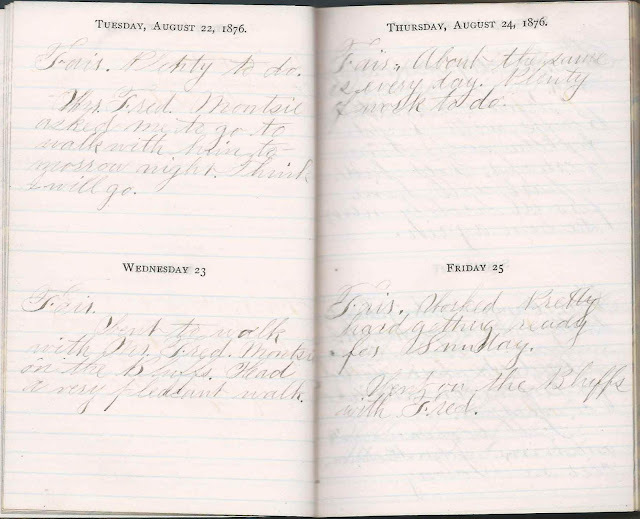 Tuesday, August 29, 1876: Fair. Started from the Vineyard with Addie & Mr. Boothe. He came as far as New Bedford with us. Had a nice time on the boat. Will stay at Mrs. Hersom's at night. 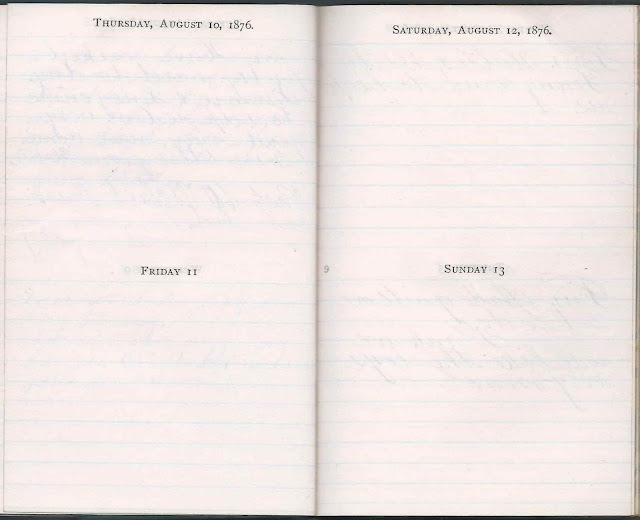 Wednesday, August 30, 1876: Fair. Came home from Boston. Miss Moss & Miss Gilpatric came to the Depot with me. 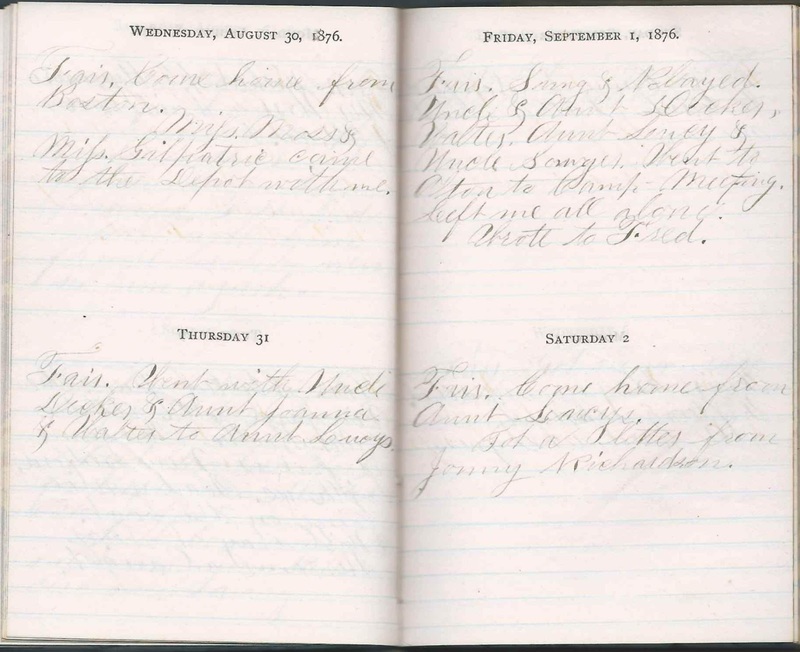 Thursday, August 31, 1876: Fair. Went with Uncle Decker & Aunt Joanna & Walter to Aunt Lucy's. 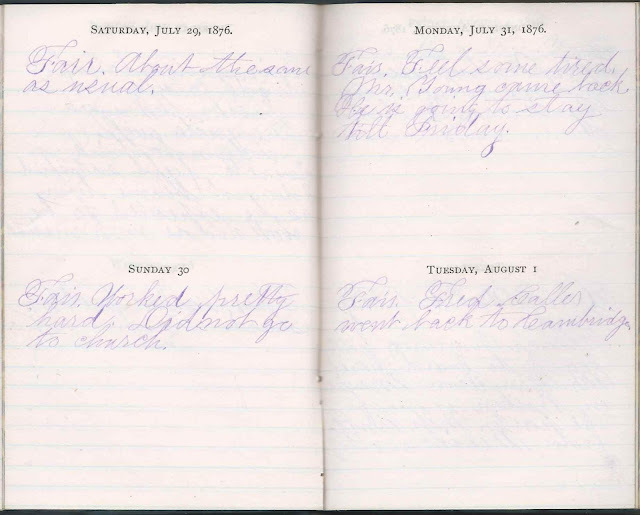 Friday, September 1, 1876: Fair. Sung & Played. Uncle & Aunt Decker, Walter, Aunt Lucy & Uncle Sawyer Went to Alton to Camp Meeting. Left me all alone. Wrote to Fred. Saturday, September 2, 1876: Fair. Came home from Aunt Lucy's. Got a letter from Jonny Richardson. Mr. and Mrs. Young and their sons Willie Young and Bertie Young - possibly all workers at the Wesleys' inn on Martha's Vineyard, but the sons were at least. Mrs. Hersom - possibly the Mrs. Hersom who would sell her business to Ida's brother Edward Everett Reynolds (1855-1945) and his partner Fred. Advance to September 1876 or return to July 1876.